The NOHVCC has completed their final report based on the feedback and participation at the public meetings held in November of 2017. This report was created to gather information about the enhancements for public land managed by the BLM in Nevada. From here, the BLM DC Office and Nevada State Office will work cooperatively to create a strategy to implement some of the suggestions that have been made. This process will begin in summer of 2018 and they will share the strategy upon completion. Join and Support The Fight To Protect OHV Use Today! Off-road Champion, Jimmy Lewis, Riding on NV BLM Trail. Popular Dry Wash Trail at Risk in Draft RMP. Elise McAllister, from Partners in Conservation, talks with OHVers about Potential Sand Wash Closures at Logandale OHV Area. Important Sand Wash Trail at Risk for Closure. The Bureau of Land Management (BLM) in the Las Vegas area is currently fronting a draft plan that could eliminate or greatly restrict both casual and event-based OHV recreation on approximately 3 million areas in Southern Nevada. The draft Resource Management Plan (RMP) creates an unjustified risk that might preclude “dry washes” from being designated as OHV routes. As OHVers know, washes are often the historic backbone of any desert-based route network. Washes can either function as a trail or trails traverse them. BRC’s Don Amador spent February 17-21 touring popular OHV recreation sites with representatives from the Southern Nevada Off-road Enthusiasts (SNORE), Motorcycle Racing Association of Nevada (MRAN), American Motorcyclist Association (AMA), and Partners in Conservation (PIC). BRC and partners also attended a meeting convened by Clark County Commissioner Tim Collins’ office, where the BLM was an invitee as well. BRC and OHV groups are not the only users concerned about the clear and present danger that is casting a dark shadow over the future of motorized access in Southern Nevada. Off-road champions and business leaders are also weighing on this important issue. “We can’t let the same thing happen to desert-based OHV use as the BLM starts its sister version of FS travel management. Now is the time for powersports enthusiasts to gird for the fight by joining BRC’s effort to preserve and protect managed OHV recreation in the deserts of Nevada,” Bosch concludes. BRC has prepared an easy to use action alert where you can select issues that are important to you and then send those comments to the BLM at the Las Vegas Field Office before the March 9, 2015 public comment period deadline. February 19, 2015 10:00 a.m.- 3:00 p.m.
Siding Road off of Hwy 50 near Mound House in East Carson City. We will need a point of contact for all volunteers so that you can be notified if there is a weather cancellation. 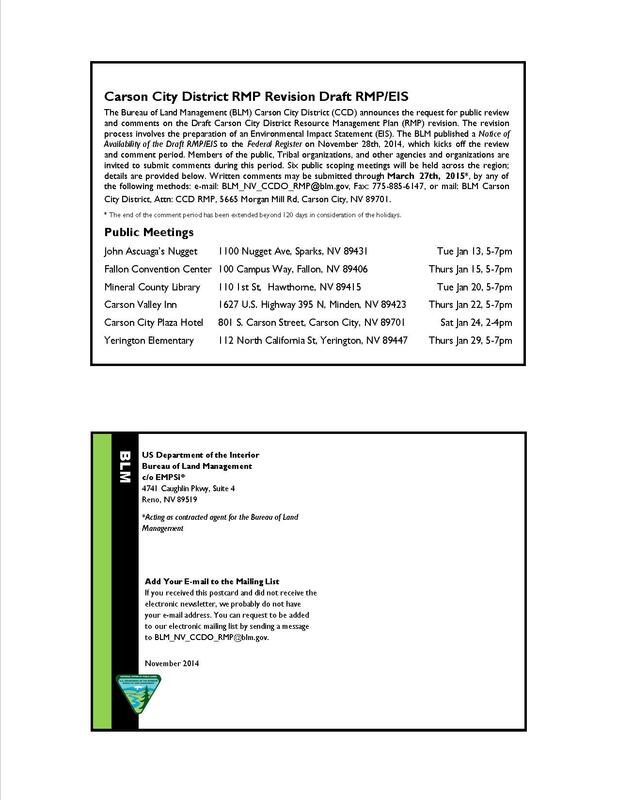 Residents interested in open space and parks along the Carson River, including Silver Saddle Ranch and the Prison Hill Recreation Area, may want to attend an Aug. 18 open house hosted through the Carson City Parks and Recreation Department. The event will be in Bonanza Room of the Carson City Community Center, 851 East William Street from 3 to 5:45 p.m. and will include information, maps and draft recommendations from the Management Plan. Written comments are also encouraged. Immediately following the open house, the Open Space Advisory Committee will hold a public meeting at 6 p.m. in the Sierra Room of the Carson City Community Center with a presentation and an opportunity to submit public testimony. 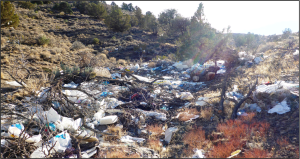 A second opportunity to view the presentation and submit public testimony will be at the Parks and Recreation Commission meeting on Sept. 2, 5:30 p.m. in the Sierra Room of the Carson City Community Center. All comments are encouraged and welcomed. The Draft Management Plan along with the maps, appendices, and comments and staff responses can be found here. The August Membership Luncheon will look at the upcoming release of the BLM’s Resource Management Plan, with a special look at the plans and the items that Carson City BLM has considered related to Douglas County and the surrounding area. We will be joined by Colleen Sievers, the Acting Associate District Manager and RMP Project Manager in the BLM Carson City District. Don Holmstrom, the new Carson City District Acting District Manager, will also be joining us. We’ll be treated to lunch at Jethro’s, and their luncheon offerings always get rave reviews.